Hasbro has shown off its new line of Spider-Man: Into the Spider-Verse toys and they give us the best look that we have seen at the villains in the movie. The animated film focuses on teenager Miles Morales as he begins his journey to grow into the heroic Spider-Man. The character is trained by Peter Parker from an alternate universe and joins other alternate versions of Spider-Man to take on the villains in the movie. Excitement has been high for the animated film, so it's cool to finally get a look at what Green Goblin, Prowler, and Kingpin will look like. 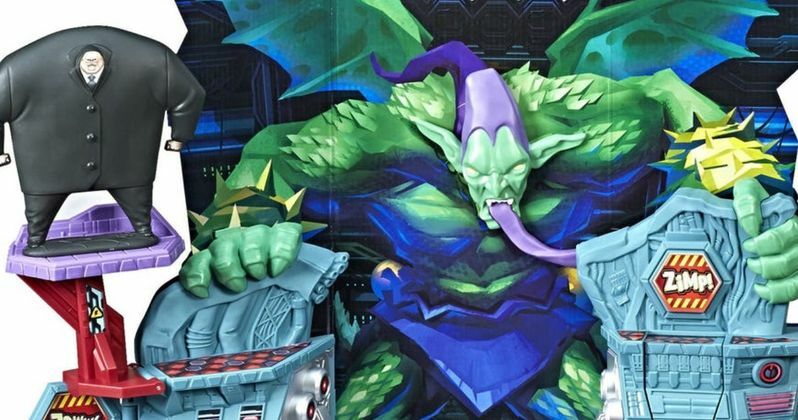 The new line of Spider-Man: Into the Spider-Verse toys features the "Super Collider" playset, which gives us our best look yet at Kingpin and a giant mutated Green Goblin. The set also comes with a Miles Morales action figure, who's packing a missile launcher to shoot at his enemies. The set, along with the rest of the toys will be available this fall. As for the cost of the "Super Collider" playset, Hasbro has it listed at $39.99. In addition to the Spider-Man: Into the Spider-Verse "Super Collider" playset, there are also six-inch action figures that you can purchase separately, which includes a Prowler figure with what looks like rocket boots. The six-inch action figure line also includes Miles Morales, Peter Parker, and Spider-Gwen, with more characters expected to be announced at a later date. Each figure includes 7 points of articulation and retails for a suggested $9.99, according to Hasbro. For fans that are having a hard time waiting for the movie, an advent calendar will also be released, which will contain 14 mini-figures, four stickers, and two cardboard builds. Also included in the Spider-Man: Into the Spider-Verse line of toys is a $60 Shock Strike Miles Morales figure that shoots projectiles as well as makes sounds and is controlled by a wrist gauntlet. There is also a twelve-inch version of Miles Morales from the Titan Hero Series and a bunch of other cool products to coincide with the December release of the film. There is not an official release date set for the toy line, but that will more than likely be announced in the coming weeks. Plans for Spider-Man: Into the Spider-Verse were developed by Phil Lord and Chris Miller back in 2014, but it wasn't until Lord and Miller announced in December that the film was titled Spider-Man: Into the Spider-Verse. They also revealed that multiple Spider-Men would appear in the film, which made several Marvel fans extremely excited. All of the promotional material that has been released for the animated story looks awesome with a somewhat darker edge. Lord and Miller have said that they wanted the animation to feel like it was taking place within a comic book as well as pushing camera angles that you can't achieve with live-action film making. You can check out the new line of Spider-Man: Into the Spider-Verse toys featuring the villains below, thanks to Hasbro.